This CD features 13 brand-new songs. It also incorporates the VBS sampler (now obsolete) I previously offered in unfinished form, and adds those songs as completed now. 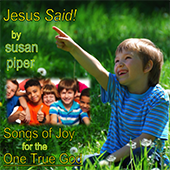 They are mostly short, laden with Scripture, full of children’s voices, and hopefully, lots of fun!